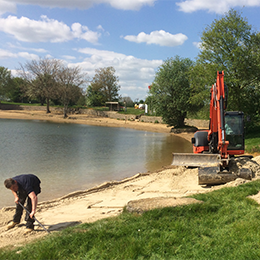 Sand and gravel are now being extracted at Mortimer Quarry near Reading. Aggregates available for purchase include as raised gravel, flint, washed ballast and concrete sand. This new addition to Hills’ operations allows us to provide further sand and gravel aggregates to customers in Hampshire, Berkshire, Oxfordshire, Wiltshire and Gloucestershire. Materials extracted at Mortimer Quarry include as raised gravel, 4-10mm, 10-20mm and 4-20mm single size flint and 0-10mm, 0-20mm washed ballast. Hills recently held a successful open day at Mortimer Quarry which was attended by over 100 local residents. The visitors saw the mineral processing plant in operation together with videos, graphics and displays about our current extraction and future restoration plans for the site.